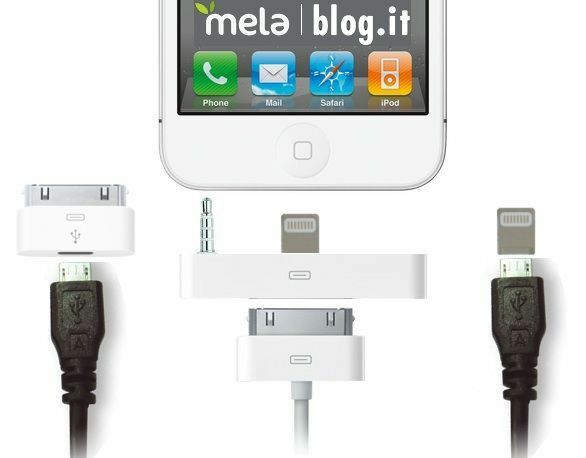 For the main 30-pin-to-9-pin adapter, Metablog.it believes that the adapter will actually be fairly large, about the same width as the iPhone itself, and utilizing the headphone jack as well as the new smaller dock port. The reason for using the headphone jack — which, unlike the iPhone 4 and iPhone 4S, is positioned at the bottom of the next iPhone — has nothing to do with transferring data, e.g. the iPod shuffle: instead, it’s structural support to keep the new iPhone from wobbling when connected by adapter to 30-pin accessories. That’s a good idea. One of the biggest problems with Apple switching to a smaller dock connector is that it wasn’t clear how it would remain stable in accessories like docks with an adapter. This proposed solution would fix the problem nicely: a new iPhone in a 30-pin dock would stick out a little bit, but it would be structurally stable and not wobble with vibrations or go easily crashing to the floor. Metablog.it’s other supposition is that the new 9-pin dock connector might be small enough that t could fit as a “hood” over a standard microUSB connector. I’m pretty skeptical of this thought: there’s a degree of electronics that need to go into any Dock Connector adapter to translate Apple’s 9-pins into proper USB. It’s an interesting conceptual thought, but I seriously doubt it will pan out.